Now that some time has passed since my scholarship-funded trip to the Glen West Workshop, I feel that I can reflect on the experience with greater objectivity, and extract some of the bigger ideas from it. Held on the campus of St. John’s College in Santa Fe, New Mexico, the workshop included writers and artists from all walks of life, and from all over the world. 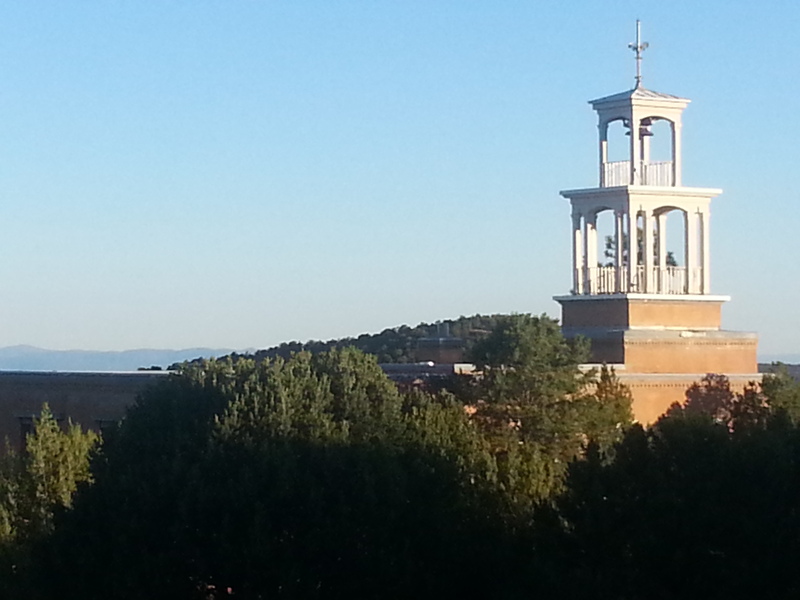 A shot from one of the sloping hills of St. John’s College in Santa Fe. The scenery was beautiful, the discussions and seminars were engaging, and the faith-based component made me take a much harder look at my own personal theology. Almost nightly, I found myself returning to scripture to examine my own beliefs in response to the claims of others beyond my denomination. What I found was this: The pastors and leaders I have known allow God’s Word to speak to them to inform their perspectives. Their hermeneutics and apologetics are without error when scrutinized from a logical, etymological, and spiritual standpoint. I became grateful for my solid foundation in the greatest of all literature. Aside from the religious component of the workshop, however, the time spent working out my own poetry was invaluable. Critiques during workshop allowed me to hear from a community that represented a broad cross-section of society, from amateur dabblers, avid readers, and experts who are highly respected in their field. In addition, the artful environment of Santa Fe provided a much-needed break from the summertime doldrums I was previously facing. The art galleries, public displays of sculpture, and a fantastic rendering of C.S. Lewis’s The Screwtape Letters on stage at the Lensic Theatre allowed me the cognitive space I needed to regenerate creativity. While the accommodations were sparse, the company, the climate, and the conversation made up for any lacking luxuries. I made a few new good friends who are very different from me, and by so doing, received bigger understandings and broader interpretations of life itself. I would recommend The Glen West Workshop to those seeking something different than the typical writing conference. Its effect on your mind and your soul will be worth it. Love the photograph of the steeple! I haven’t been able to process the week as well as you have, but I hope to be able to sometime. Thanks for this!